Giardini Naxos. Ships anchor in Giardini Bay and transport passengers via tenders to the dock, about 20 minutes from Taormina. Giardini Naxos itself got wonderful beaches and numerous water sports operators right by the dock offering scuba and snorkeling trips. Restaurants, bars, gelaterias and cafes line the beach. Taormina is the obvious destination for those staying in Giardini-Naxos, tantalizingly placed on the side of a hill to the north. It is in walking distance, but those unsuited for climbing many sets of stairs would do better to take the bus (€1, €2.50 return) which departs from the Recanati bus station. Another bus runs from Taormina further up the hill to Castelmola, which is also worth a visit. Down the hill is the beautiful Isolabella, a small island which juts out from the coast and is usually bridged by a strip of beach, depending on the tide. Ships often offer shuttles, free or at a charge. Taxis also wait at the dock and typically charge about 30 euros each way (for six people) -- and tend to be a quicker and easier mode of transportation. Make sure you negotiate that fare before you get in to the cab. 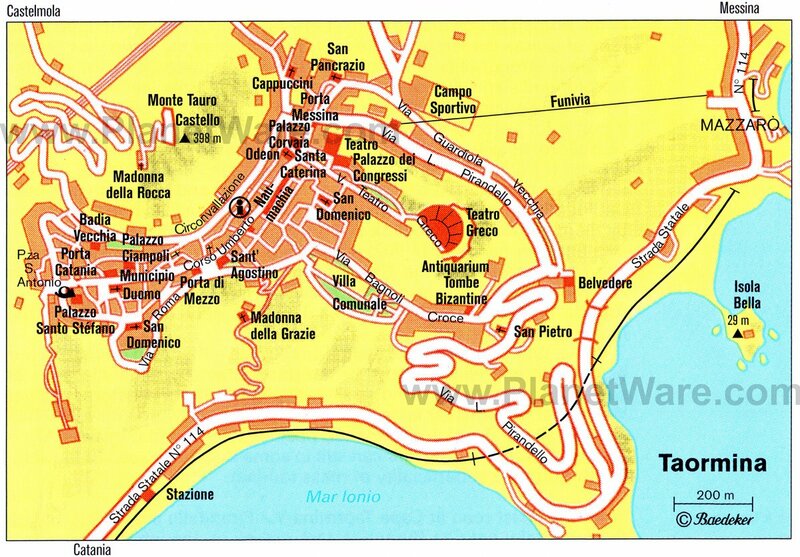 The Taormina–Giardini Train Station (so named because it serves both towns) is on the sea front, 1 mile south down the hill from the center of town. Taormina is a charming hillside town on the east coast of Sicily, Italy and is one of the island's main tourist resorts. Whilst Taormina can be hot and busy during July and August, crowded with Italian tourists, it is far more pleasant and (slightly) less busy during the rest of the year. Taormina is all about shopping, strolling and people-watching. Many package tourists stay at the nearby beach resorts of Giardini Naxos (below Taormina on the coastline, some 3 km away to the south) where the cruise ship will tender. Teatro Greco - impressive open-air (mainly Roman(!)) theatre, with great views up and down the coast and across to Mount Etna. The Torre dell'Orogio clock tower. Plenty of agencies offer day trips to Mount Etna. You are not allowed to walk right to the top unless you have a guide (and possibly not even then, depending on the state of the eruptive activity), but the lava flows are impressive. It is over 3000m high, so wear warm clothes - it can be cold even in summer, and the top is often covered in cloud. There are plenty of souvenir shops. Shops are generally open from 9:00am – 1:00pm and 4:00pm – 8:00pm Monday through Saturday. Many shops are closed on Monday morning. In Taormina the main shopping street is Corso Umberto. The most popular purchases are handicraft items including; embroidery, ceramics, wrought-iron and jewelry, especially coral and obsidian (a black glass of volcanic origin). Most tourist orientated stores accept major credit cards. The Limoncello - a sweet lemon alcoholic drink served chilled after a meal is refreshing and sold widely.